This week, I wanted to hear from the Aldermanic Candidates that aim to govern the 6th Ward for the next four years. The 2011 Alermanic election was won by 104 votes. Coincidentally, this afternoon I saw 104 people in line for Garret's Popcorn. First up was Desert Storm War Veteran Sgt. Brian Garner. We talked mostly about the Chatham Co-op Seniors losing their heat last week. According to Garner, 70 percent of the Co-op homes lost access to heat. Garner said that calls to the current alderman were made, but weren't returned, so he decided to take action. His friends and family rounded up blankets and space heaters, and brought them over to the seniors. I thought that was a good gesture. Wouldn't expect anything less from a Veteran. Salute! Richard Wooten is an Army Veteran, Chicago Police Officer, and Pastor. He calls it like he sees it. I've seen this guy burst into a room full of elected officials and candidly tell them what's on his mind. I admire is courage. We talked mostly about Participatory Budgeting. According to Wooten, each Chicago Alderman get's an annual budget of 1.3 million dollars that's to be allocated toward Ward Improvements. If elected, Richard Wooten plans on opening up the budget meetings to all 6th Ward residents, even teenagers. Transparency is needed, and new ideas are welcomed, is his motto. 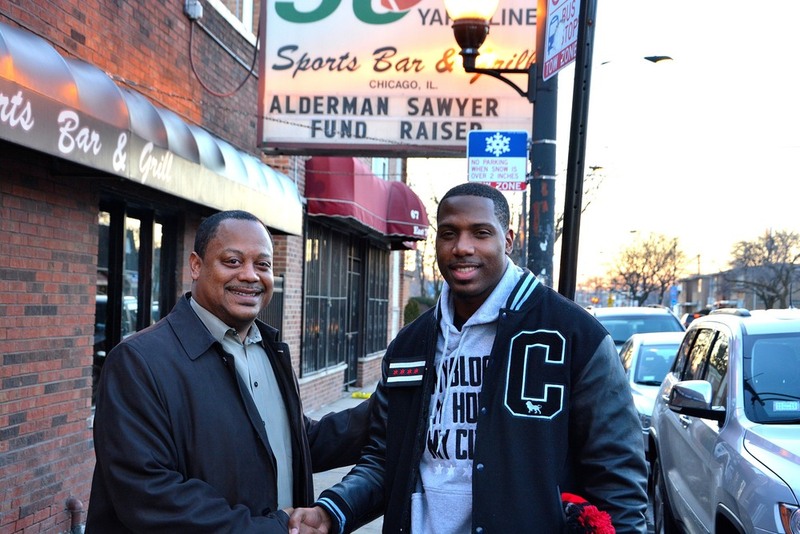 My last interview was with 6th Ward Alderman Roderick T. Sawyer. I try and shout him out whenever I'm on CAN TV or Chicago Tonight, or really any Chicago Media Outlet. I do this because he's a true role model. He's always been accessible any time I've wanted to chat. More importantly though, he's a neighborhood guy. We talked about his (6th Ward) vision. The Sawyer Team is all about economic development during his next term. Regardless of who you vote for, just vote. When we head to the polls on February 24th to vote, we're doing something that very few people in the history of the world have had the privilege to do. We're taking the fate of our communities in our own hands, and deciding what we want to do with it. And when I think of what people like Dr. Martin Luther King sacrificed for us to vote, it pains me to hear that less than 50 percent of some communities don't even vote. (Lack of appreciation for our liberty). My Block My Hood My City travels across Chicago's 77 neighborhoods and tells the stories of the people and places that make this city great.